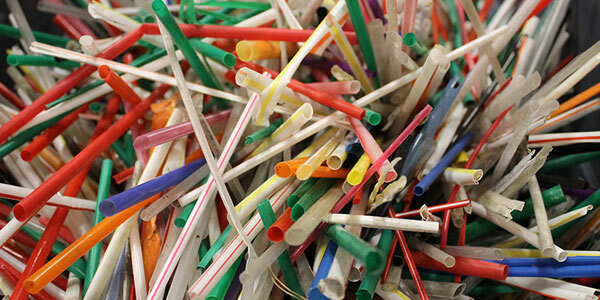 Mixed industry response to European ban on plastic straws, bags and cotton buds. The European Parliament has voted to ban widely-used, single-use plastics such as bags, straws, drink stirrers, balloon sticks, and cotton buds, putting the burden on manufacturers to recycle more in an effort tackle ocean pollution. Under the proposal, some throw-away plastic products with readily available alternatives would be banned by 2021, which could lead to a stronger demand for bio-based materials. Under the plans voted on yesterday, EU states would be obliged to recycle 90% of plastic bottles by 2025, while producers must help cover costs of waste management. The plan, which was originally proposed by the European Commission in May, targets some of the most common ocean-polluting plastic. The list of banned items such as cutlery and cotton buds were chosen because there are readily available alternatives, such as paper straws and cardboard containers. MEPs also added polystyrene fast-food containers and products made of oxo-degradable plastics, which critics say do not fully break down, to the list. The EU executive proposed the ban in May, following a surge in public support attributed to documentaries such as David Attenborough’s BBC Blue Planet series (pictured left) which highlighted the negative impact of plastic pollution on marine life. Trade body European Bioplastics (EUBP) gave a lukewarm response to the plan. Chairman François de Bie said that while EUBP fully supported the transition from a linear to a circular economy and a reduction of single-use plastics products where feasible, hygiene and food safety should not be compromised. In a statement, EUBP said that single-use products, such as plates and cutlery, could be biodegradable-certified compostable plastics and fulfil Europe’s rigorous requirements and standards for health and safety. However, it added that it fully supported the Parliament’s suggestion to restrict products from oxo-degradable plastics. Environmental groups such as Greenpeace welcomed the Parliament’s plans, but said national governments needed to resist “corporate pressure to continue a throwaway culture”. The plastic industry was also critical of the Parliament’s plant to ban single-use plastic items. PlasticsEurope, which represents plastic manufacturing firms, said the legislation needed to be much clearer, raising concerns that the measures voted on yesterday had been rushed through too quickly and could risk “generally blurring the market”. The trade body also said EU policymakers had used ambiguous definitions used for ‘plastic’ and ‘single-use plastic product’, saying it would lead to problems in interpretation and implementation at national level with the consequence of the internal market being fragmented. The EU’s final rules still need to clear some procedural hurdles, but is expected to go through and come into force in 2021.